Need a Stranger Things refresher before watching season 2? Let Millie Bobby Brown aka badass Eleven school you with an epic rap recap. 13-year-old Millie Bobby Brown isn’t just your average breakout Hollywood star; she’s rocking the small screens now as Eleven from Netflix hit Stranger Things, but we wouldn’t be surprised if she dropped a rap album either. Swinging by The Tonight Show, Millie ran through run-of-the-mill interview questions before Jimmy Fallon (finally!) invited her onstage to drop some bars. About Stranger Things of course. Fans might already be aware of the actress’ rapping talent thanks to her impressive cover of Nicki Minaj’s ‘Monster’ verse last year (and also on Jimmy Fallon), but nothing will be able to prep you for the badassery that was Millie’s performance. Starting out swaggeringly slow, Millie introduces Stranger Things (“Let’s go back to Indiana, circa Nineteen Eighty-Three/ Just four boys in the basement chillin’ playin’ D&D”) and spits her way through major plot lines, throwing in bits about Will, Dustin, Joyce’s Christmas light saga and even a little #JusticeForBarb. Then lending influence from yet another iconic female rapper – this time from Cardi B –, Millie declares Eleven’s love for Eggos and how it’s “Bad news when you see that bloody nose”. Of course, she ends her epic set with a mic drop. And we wouldn’t expect anything less! Watch Millie’s performance here, and scroll down to watch the rest of her interview on The Tonight Show! What do you think of Millie’s rap recap? Should she venture into music? Let us know your thoughts in the comment section! As per tradition of the year’s spookiest event, Hollywood turned out in full force with their Halloween costumes. There were celebrities dressed to the nines, film characters and other legendary faces. Let’s dive right in to the best costumes of 2017! Yep. Stranger Things have definitely happened. Stepping out with Hollywood BFF Jonathan Cheban as Sonny Bono and Cher, Kim’s get-up even received a nod of approval from Cher herself! Incorporating her baby bump into this year’s outfit, Jessica Alba dressed up as Juno from the hit movie of the same name. Needless to say, this mama slayed Halloween! A vision in white, this leggy supermodel channelled her Marilyn Monroe best. Demi’s homage to the late Selena Quintanilla is definitely one of our favourite Halloween transformations on this list. From her purple jumpsuit to her hoop earrings to her dramatic makeup, Demi bore an uncanny resemblance to the iconic singer. The world’s been swept up in Cardi B fever and this comedian did perfectly on his hilarious version of the rapper, down to her swagger-filled poses, albeit looking kinda uncomfortable. A truly dedicated performer, Dua Lipa committed to her Harry Potter costume all the way – even if that meant having to go onstage as the Boy who Lived. Gotta admit, it was kinda weird seeing her in full Hogwarts attire, but Dua’s performances from that day ended up giving us all life. The Carter fam is known for their sick Halloween costumes. And this year’s no difference, with the Hollywood It couple channelling another powerhouse duo: the Notorious B.I.G and Lil’ Kim. There’s gotta be someone dressing up as the late King of Pop every Halloween, and this year, Kourtney Kardashian steps up the plate. Kim K’s Madonna costume is worth a mention as well! Halsey’s version of Daisy Buchanan from The Great Gatsby is definitely worth gasping over. G-Eazy’s Jay Gatsby however… pales in comparison. Looking near unrecognisable in her Dolly Parton getup, Ellie Goulding rocks her sequinned cowboy boots and blinged up cowgirl-style dress like a natural. Could this be a hint of the musical genre she’s steering towards? The newly engaged rapper perches on her throne as Disney’s Cruella De Ville (or Bruella, according to Cardi), looking totally bomb while at it. Which celeb Halloween costume is your favourite? Share your picks in the comment section! More related stories: 8 Gorgeous Actors Who Were Transformed By Intense Movie Makeup, We Rank The 7 Scariest Horror Movie Characters Of All Time, Can You Tell These A-List Celebrities And Their Doppelgängers Apart? Niall Horan's Headed To Singapore In June Next Year! If you’ve been harbouring that flicker of hope that Niall Horan would come to Singapore for an official show, your wish is coming true! The last time Niall Horan visited Singapore, it was for a super secret showcase where a few fans and media had the opportunity to hear the Irish singer perform a few songs off his latest album, Flicker. It was a total dream, but the only pity was that Niall couldn’t play a full show for all of his fans in Singapore. And now he’s back! 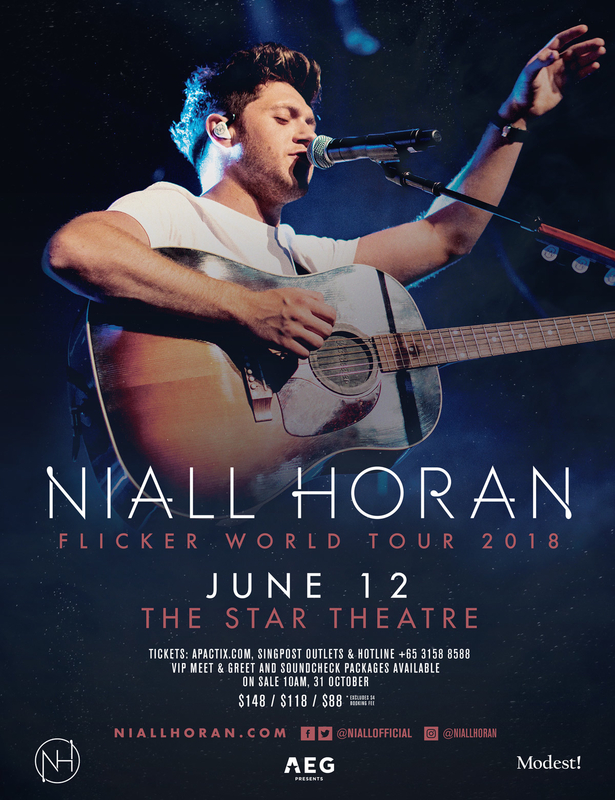 As part of his Flicker World Tour 2018, Niall’s bringing his show to Singapore on Tuesday, 12 June 2018 at The Star Theatre! How excited are you for Niall’s show? Sound off in the comments section! Great News, Ed Sheeran's Shows In Singapore Will Go On As Scheduled! Local Sheerios will be pleased to hear that Ed Sheeran’s doctors have given him the green light for the Singapore leg of his world tour! When Ed Sheeran broke his arm back in mid-October, thousands of get well soon wishes poured in from fans all over the world. But seeing as the crooner was scheduled to kickstart his Asian tour in Taipei just a few days later, the main question on everybody’s mind was: would Ed still be able to perform? Fans can now breathe a sigh of relief because even though the doctors had initially advised Ed to cancel his tour to let his arm recuperate, they’ve given him the go ahead – which makes Ed’s Singapore shows on 11 and 12 November his very first pit stop! The rest of his tour dates in Kuala Lumpur, Bangkok, Mumbai and Dubai will go ahead as scheduled, while the Osaka, Tokyo and Manila tour dates will be rescheduled to April 2018. Unfortunately, the concerts in Taipei, Seoul, Hong Kong and Jarkata have to be cancelled because they’ve (in Ed’s words) “been impossible to reschedule for next year”. However, he reassures fans that he is “working hard with my team to try and come back to these places soon as I can to see all of you”, so chin up Sheerios! In the meantime, watch Ed Sheeran perform broken arm parodies to his very own hit songs! “When your arms don’t work like they used to before…” Hilarious. Will you be catching Ed Sheeran in concert? Let us know in the comment section! More related stories: Demi Lovato Proves There’s Much More Behind The Scenes We Don’t Know About, 6 Things You Need To Know About Binge-Racing According To Netflix, Did Taylor Swift Just Sing About Her Boyfriend While Throwing Shade At Her Ex? It’s finally here! Our October cover star Camila Cabello’s musical ode to her heritage ‘Havana’ is scorching up the charts with an epic mini-movie of a music video to boot. ‘Havana’ has become Camila Cabello’s biggest solo hit so far. Already amassing career peaks of #2 on the UK and Australia charts, there’s without a doubt that the hilarious 6 minute-long video clip she just released for it will propel the track’s success further. We take a look at the highlights from the video, where Camila takes on multiple starring roles. The video opens with Camila catching her lover in bed with her best friend – all in classic dramatic fashion. The dialogue is also exaggeratedly cheesy in the style of telenovas (Latin American soap operas) and as the screen fades out, we realise that Nerd Camila is actually watching Telenova Camila as a character on a fictional show. A plot twist within the first 2 minutes! Before we cut to Nerd Camila though, can we just say Camila is showing some serious acting chops in her fictional telenova? Going from melodramatic shocked to distraught, Camila plays off every emotion with enough convincing to not count her out on making a proper screen debut in the future. So Nerd Camila happens to be a homebody who loves being with her abuelita (Spanish for ‘Grandmother’), but her granny actually wants her to experience the outside world, even suggesting to follow her on-screen sister to party. Erm… we’re pretty sure some of us wish our parents could be as open-minded to this notion, and let us stay outdoors without curfews – if only! After her granny dozes off at home, Camila sneaks off to watch a late-night movie titled ‘Havana’ on her own, where Camila – surprise! – is also the film’s feisty leading lady in red! Movie star Camila enthrals on stage performing her spicy single, and it’s evident that Camila is a natural in front of the cameras. Think Camila would just stand on stage and sing? Not a chance. Flirting with a fellow dancer in the Latin club, Camila shows off her salsa-inspired moves of shimmies and shakes, accentuated by her flapper dress. It’s common knowledge that Camila could nail choreography since her Fifth Harmony days, but who knew she could burn up a dancefloor like this?! Movie star Camila eyes her love interest and follows him outside in the fictional film’s climax scene, but in a surprising twist, rejects him and declares she loves herself more than being together. “That’s it?! That’s the ending? You end up alone?”, yells Nerd Camila from the cinema seats. “Hey sweetie. If you don’t like my story, go write your own!”, actress Camila fires back, breaking the fourth wall. We’ve seen multiple pop stars play different roles in music videos, but never this amusing! Feeling inspired after watching the movie, Camila proceeds outside and breaks into a dance just as her crush cycles by and crashes. She helps him up, and the two launch into a romantic sidewalk dance – finding love and signalling a happy ending for our Latina dreamer! Check out the music video’s rad poster, and watch the full music video below! What was your favourite part of the video? For more on Camila Cabello, pick up a copy of our October issue out on newsstands now!